Houston Baptist University is pleased to announce a new scholarship opportunity for students, recognizing a pioneer of computer science and military service, Rear Admiral Grace M. Hopper, PhD, by establishing the Grace Hopper Scholarships. This fund is established through a generous gift from Mr. Holly Frost and Ms. Kathaleen Wall. Mr. Frost is an entrepreneur who created one of the earliest and most successful computer memory companies. Through the gift of $500,000 per year for the next four years, HBU will be able to support up to 100 students annually in high-demand, STEM-related academic programs. Scholarship recipients will demonstrate Dr. Hopper’s persistence, technical knowledge and selfless service as students in Computer Science, Cyber Engineering, Electrical Engineering, Chemistry, Mathematics or Physics at HBU. The goal of the scholarship is to support qualified students during the second and third years of their degree programs to enhance the probability of their graduation. The full press release acknowledges the donors (Holly Frost and Kathaleen Wall) and the distinguished career of Grace Hopper. Approximately 100 scholarships, averaging $5,000 each, will be available for the 2019-20 year. Qualifications for the scholarship, and the online application, are available from this link. The Smart Factory system will accept multiple inputs, in order to control multiple outputs, to maintain signals within desired levels. In the Smart Factory, students will control temperature and water level, build components and systems, and include wireless control and cybersecurity. The security of the inputs, outputs, and components will be considered during design and implementation. This introduces first-year students to the Internet of Things (IoT), and how engineering and computer science can help keep the world of IoT safe and secure. Read the complete press release here. The College of Engineering at Houston Baptist University is a Champion of National Cybersecurity Awareness Month (NCSAM) 2018. The College join a global effort among businesses, government agencies, colleges and universities, associations, nonprofit organizations and individuals to promote the awareness of online safety and privacy. A multi-layered and far-reaching campaign held annually in October, NCSAM was created as a collaborative effort between government and industry to ensure all digital citizens have the resources needed to stay safer and more secure online while also protecting their personal information. As an official Champion, HBU recognizes its commitment to cybersecurity, online safety and privacy. 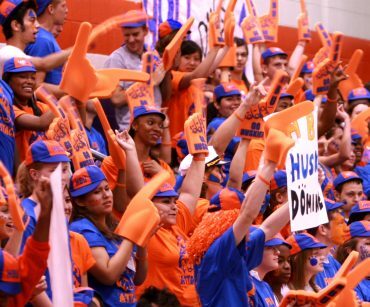 The College of Engineering at HBU offers B.S. degrees in Cyber Engineering, Electrical Engineering, and Computer Science. Students in all three of these degrees will learn to design and secure electronics, control, and computer systems. Dean of the College, Dr. Stan Napper, says that “in addition, we want to help all of our industry partners, community leaders, students, and families to be more secure and better prepared to deal with living and working in cyberspace”. The HBU College of Engineering supports the NCSAM #CyberAware campaign through its comprehensive goal of Securing America’s Future Through Engineering. Every graduate will learn to utilize God-given resources and talents to serve humanity by solving technical challenges efficiently and securely. In doing this, we hope to make the world healthier, more productive, and more secure. The Houston Baptist University College of Engineering dedicate the Engineering ClassLab at 11:30 a.m., Tuesday, Sept. 18, in the SAFE (Securing America’s Future Through Engineering) Lab in Atwood II on HBU’s campus. Read More. Trustees, administrators and friends of the University gathered to dedicate the SAFE Lab at HBU. Dr. Stan Napper, Dean of the College, welcomed HBU Trustees, Enginering Advisory Board members, HBU administration and faculty and staff, and other guests. 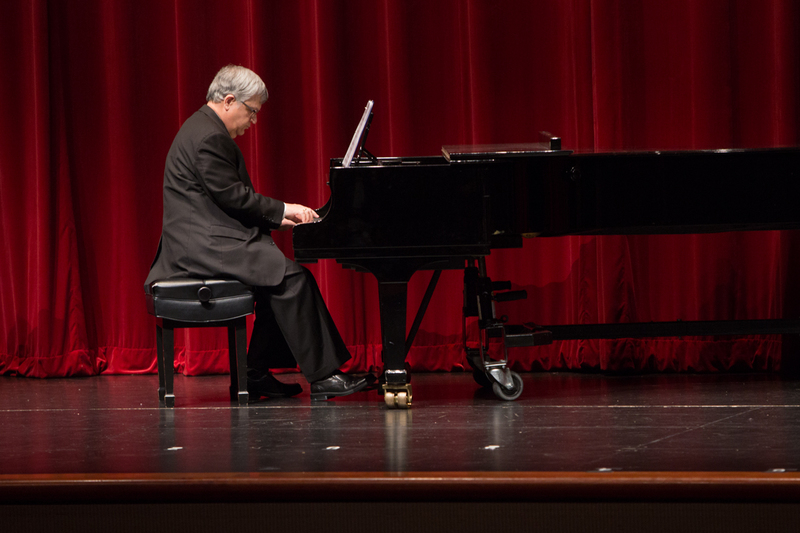 Dr. Napper introduced the faculty and staff of the College to the guests. 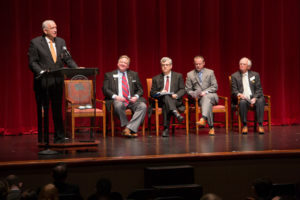 Dr. Robert B. Sloan, HBU president, thanked the College of Engineering Advisory Board and called the launch of the College a “landmark moment”. HBU Trustees launched the College in 2017, and dedicated its first ClassLab in 2018. The College of Engineering celebrated its first week, August 27-31, 2018. Our first visitor was Ms. Sue Sloan,First Lady of HBU and wife of President Sloan. She recorded this photo of Dr. Drake hanging up the College banner outside our location in Atwood II. Dr. Robert Sloan, President of HBU also visited on the first day. He prayed with students, visited the labs, and thanked the College faculty. Often described as having “negative unemployment,” the cybersecurity profession demands a steady pipeline of new talent. Many of today’s universities offer programs that produce fresh-faced cyber professionals armed with the latest technical talents, but the programs that really stand out, cyber leaders say, are the ones that align their curricula with the strategic needs of real-world business. This interactive panel will showcase partnerships between security leaders and higher-education institutions that seek to foster a pipeline of high-quality cyber hires. Join the conversation to share the skills you seek in your newest team members. During the session, the panel addressed the key skills that cybersecurity professionals need to succeed today, the pipeline of cybersecurity talent, and effective collaborative models. Dr. Napper described his experience working with industry advisors and partners at Louisiana Tech University, where he served as dean of engineering and science for 9 years, and at Houston Baptist University, where he became Founding Dean of the College of Engineering in August of 2017. HBU’s new College of Engineering offers three new programs – Bachelor of Science in Cyber Engineering, Bachelor of Science in Electrical, and Bachelor of Science in Computer Science, beginning in the Fall of 2018. Cyber Engineering is a new field that prepares graduates to design secure systems at the interface of operational technology (electronic and mechanical systems) and information technology (computer and software systems). Electrical Engineering and Computer Science share fundamental concepts, laboratory resources, faculty, courses, and professional goals with Cyber Engineering. This unique combination enables the College of Engineering to produce graduates to meet the demands of all of these industries, and to address cyber threats of many types. Together, these graduates will help meet the challenge of Securing America’s Future Through Engineering (SAFE). Dr. Keith Drake and Dr. Stan Napper judged the projects at the 2018 Houston Science and Engineering Fair on February 24 to identify the projects, and students, who made the greatest impact on cybersecurity. Award winners received a gift from the HBU College of Engineering. 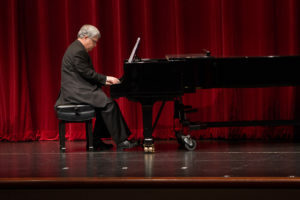 The first-place winner received the offer of a Merit Scholarship Award to attend HBU. Dr. Stan Napper, dean of the College of Engineering at Houston Baptist University, presented the Cyber Engineering program as a key solution to the critical shortage of cybersecurity workforce. Dr. Napper spoke during the 2nd Annual Houston Cyber Summit, on Feb. 28, 2018 at the George R Brown Convention Center in Houston. In addition, Dr. Nap per spoke about the distinct features of the new programs in Cyber Engineering, Electrical Engineering, and Computer Science at HBU, which will provide graduates to meet the significant demand for a cyber workforce. These degree programs combine STEM (Science, Technology, Engineering, and Math), IT (computing and Information Technology), and Faith (Christian values and beliefs) to produce new professionals for the “digital workforce” that is under-served in the Houston metro area. These graduates will utilize God-given resources and talents to serve humanity by solving technical challenges efficiently and securely. The Cyber Summit agenda was organized by members of the Cyber Task Force, of the Greater Houston Partnership. The Cyber Task Force released an executive briefing, and a cyber preparedness assessment during the Summit. Dr. Napper is a member of this Task Force. The HBU College of Engineering (hbu.edu/engineering) was also a Community Partner Sponsor of the Cyber Summit, and presented information on the College to attendees in the exhibit hall. For more information, see www.houstoncybersummit.com, or www.cyberhouston.org. These roles and responsibilities formed the key components of President Sloan’s “Charge to the College of Engineering,” during the Commissioning Service on January 31, 2018. 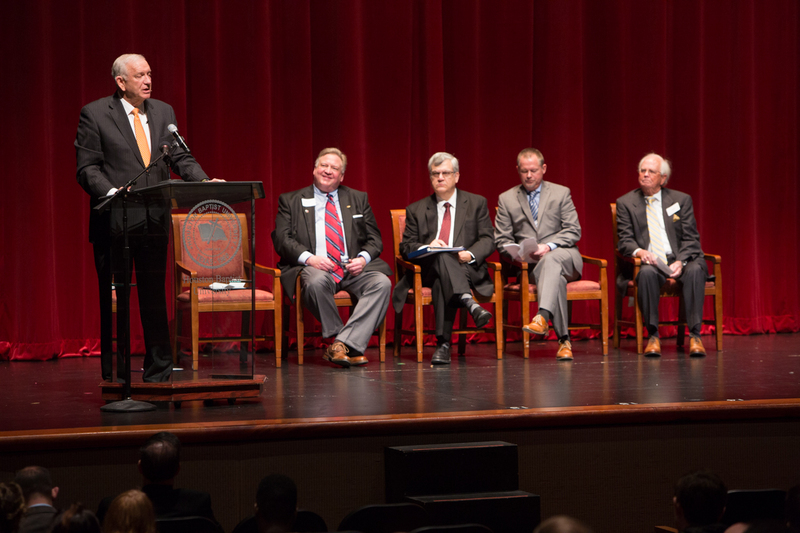 A special Commissioning Service marked the beginning of the College of Engineering at Houston Baptist University. The ceremony was held during the weekly student convocation on January 31, 2018. The event was broadcast live on Facebook, and can be viewed on the HBU Facebook page. 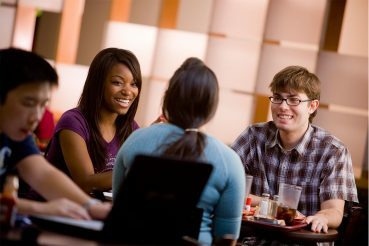 The College of Engineering is recruiting the first cohort of students in the fall of 2018; students may major in Cyber Engineering, Electrical Engineering and Computer Science*. The launch is the result of work by the Engineering Advisory Board, University administration and the Board of Trustees, and especially the support provided by the MD Anderson Foundation and the Fondren Foundation. Sloan charged the leaders of the college to remain true to its founding principles, and to the mission of the University as a whole. He credited the advisory board, chaired by Carl Glaw, for its commitment to seeing the college become a reality. 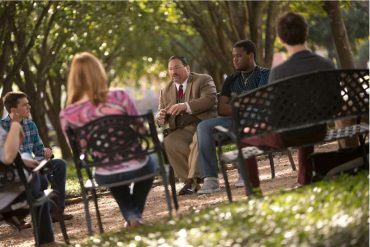 The school continues to recruit students, faculty and support. Visit HBU.edu/Engineering for more information. On the February 14, 2018 edition of the HBU podcast, “Think About It…”, Dr. Stan Napper, Dean of the College of Engineering at HBU, describes his journey to HBU, his mission and motivation, and some of the steps HBU is taking to launch a new College. 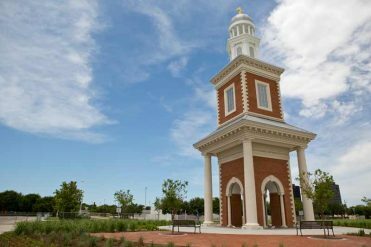 This podcast, one in a series of thoughtful conversations with HBU faculty and leadership, introduces the new leader and the new college.